An official website was launched today announcing an original TV anime titled Action Heroine Cheer Fruits. A teaser promotional video was also released. 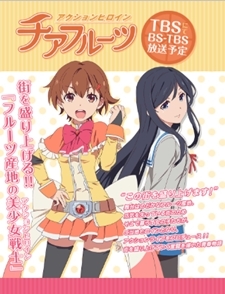 The anime is set to be broadcast on TBS and BS-TBS. The anime, along with its promotional video, was previously revealed at the TBS Animation Animaru booth on Comiket 91 held in Tokyo Big Sight, Japan, on December 29-31, 2016. The cast members of the anime also attended the event, namely M.A.O (Mao Ichimichi), Rie Murakawa, Miku Itou, with idol members Yuuki Hirose (from AOP), and Haruka Ishida (from NO NAME). Erii Yamazaki also attended the booth but her participation in the anime is still planned. "Support the city!" The setting takes place in a peaceful area for fruit production. Since the city is losing its vibrancy, the local girls became the city's heroines! This is the story of the youth and their struggles in making the city's excitement back again. is this gonna be locodol-nourin mix? Eh ... Shaft, right ? Too tame to be shaft. I hate how anime titles read like a bunch of random unrelated english words thrown together. Doesn't look like shafts color design or line art. Also cast is too diverse for Shaft's usual production. Looks good, please no male interest. Looks like a cute show. This looks more Diomedea-esque to me honestly... at least in my honest opinion. Other than that, this looks promising in a way but I want to see the staff first. Eh, TBS original titles have been a hit or miss recently. They seem to picked a good collection of cast so I'm somewhat optimistic. I thought I was the only one lmao. It definitely looks like Shaft.